Hello and good morning to you once again! The challenges are flying today, and I'm here with my second post of the day to share Peachy Keen Challenge #49 with you. We have a wonderful sketch to follow, created by Angelica, and I know you're going to have sooooo much fun playing along with it. I sure hope you can, because not only do we love to see what you're doing with your Peachy Keen Stamps, there's a Happy Mother's Day stamp set from Peachy Keen Stamps that will go to one very lucky player! For my card, I used the newly released PK-278 Easter Basket Paint Fight stamp set. This set is so darned cute, and includes the Happy Easter sentiment, and paint splotches, which I stamped on the chick, paintbrush bunny's foot, and on one square, making my own background paper to match the colors of the card. 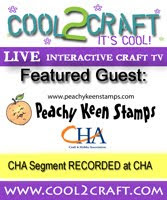 Have you checked out the bling that's available in the Peachy Keen Stamps Store? That's where these pretty sparkles of flourish came from, and I just LOVE them! You can find them in clear and black, as well as white and black pearl. One thing I love about the clear and white flourishes in particular, is that you can color them with your Copics to match whatever project you're working on. I did a little faux stitching around each square, and added some Flora Doodles to the polka dotted squares. The paper for this card all came from my scrap box. You'd think as much as I try to use those scraps up that my stack would get smaller, but I'm just not seeing that yet! LOL!!! Be sure to hop over to the Peachy Keen Challenge Blog to check out all the SUH-WEET and inspirational cards that my DT sisters have created! We have a very talented guest designer working with us this week, too. Liz Munoz of Liz's Paper Loft has an adorable card prepared, and she'll be bringing you peachy inspiration all week on the Peachy Keen Stamps Blog. Please stop by and visit her and leave her some love. I promise you'll be glad you did when you see what she's been up to!! Thanks once again for stopping by today! As always, I wish you many happy blessings and lots of happy stamping! Lorie you have done it again! I love what you have done with those stamps! The tiny swatch of patterned paper you made with the color splash is brilliant! Love the images and the way you showcased them! It is always a joy to visit your blog! How utterly gorgeous is this then! I would never in a million years have thought to put the PK bling on the card and you've done just that with amazing results. No wonder I want you to adopt me!!! I LOVE it! Lorie, this card sooo cute...love the PK bling you added and my gosh girl, your coloring is awesome!!! I sooo need to take some copic coloring classes. OH MY GOSH !!! that is super cute!! Super super cute!!! Love it Lorie. hi Lorie! Love Love Love your spring card. Each image is soooo adorable and goes beautifully with your dp! So cute, Lorie! Your coloring is amazing! Really cute card! Love the bling. Wow! Another awesome Lorie creation!! Love those cute Peachy Keen images!!! Lorie, first of all, thank you for the sweet, sweet comment you left on my blog...I have missed you too!!! How I wish there were more hours in a day to visit all the people I love. So super cute! Love the sketch, think I may have to play along! Lorie - this card made me smile out loud. I don't know how you do it time after time but you certainly do. Just love the happy spring-y-ness to this one ~ it's pure sunshine! Lorie... this is just GORGEOUS! The papers and the embellishments are just incredible! I love those stamp and coloring too! As always love your creations!